Address: 8403 S. Old Oregon Inlet Rd. 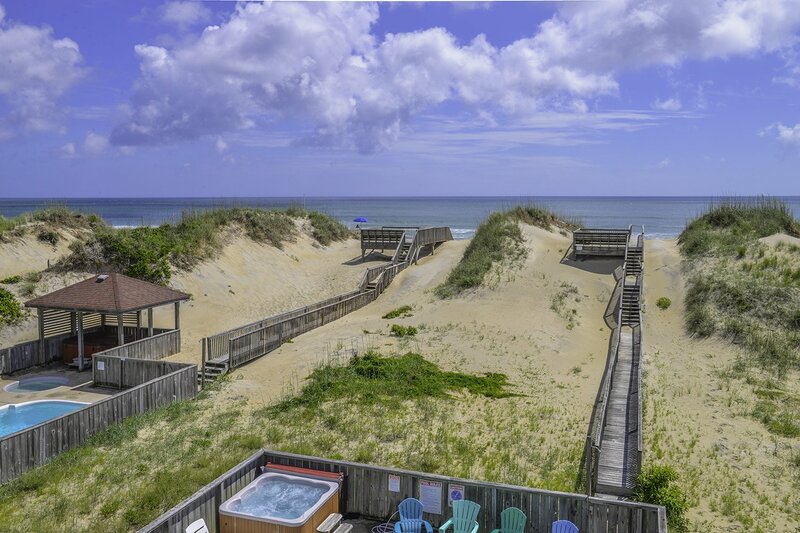 Beautiful decor, comfortable furnishings & an extensive amenity package ensure a grand time when vacationing at Never Never Land, a recently updated Ocean Front home located in South Nags Head. Bright & beachy w/spectacular Ocean Views, Private Ocean Front Swimming Pool, Hot Tub & Rec. 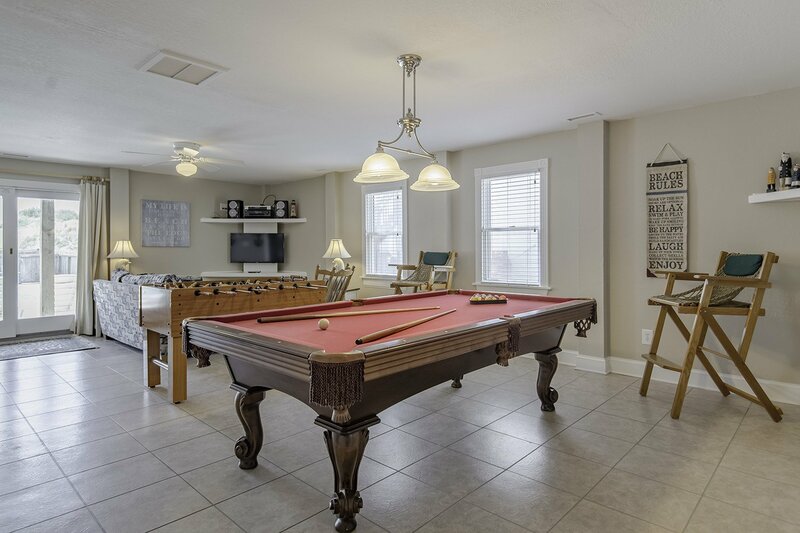 Room w/Pool Table, this home will provide endless fun & relaxation for your family. The top level provides endless views, is open, spacious & perfect for entertaining & spending time w/family & friends. The mid-level has 5 bedrooms & a covered porch overlooking the pool area & the lower level has a Rec. Room w/Pool Table, Foosball, TV Area, & access to the pool patio & private walkway to Beach. South Nags Head is a great place to vacation & has a quiet, relaxing atmosphere yet is convenient to many shops & attractions including the Bodie Island Lighthouse, Oregon Inlet Fishing Center, Outer Banks Fishing Pier/Fish Heads, Tanger Outlet Shops & several outstanding restaurants. Ground Level: Parking for 6 Cars, Basketball Hoop, Covered Parking for 1 Car, Covered Entry, Rec Room w/Full Size Pool Table, Foosball, LCD TV, DVD, Stereo, Queen Sleeper Sofa, Wet Bar w/Full Size Refrigerator, 2 Bedrooms (1 w/2 Bunk Sets & LCD TV & 1 w/Queen & LCD TV), Shared Full Bath, Laundry Area, Direct Access to Covered Area w/Picnic Table, Gas Grill, Enclosed Outside Shower w/ Commode & Sink, Private Swimming Pool (Can Be Heated for $200.00 Per Week , Plus Tax - Please Bear in Mind That Pool Temperature is Subject to Outside Temperatures & Conditions), Hot Tub, Pool Furniture, & Boarded Walkway to Beach. 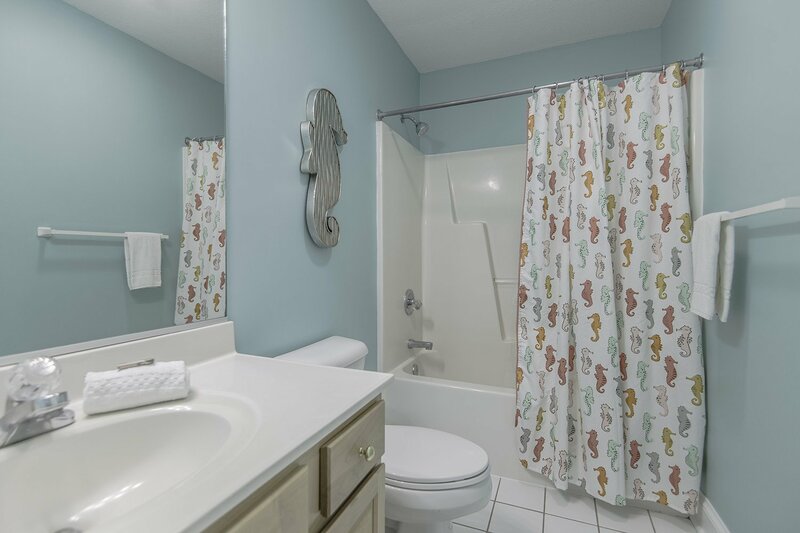 Mid-Level: 5 Bedrooms (1 Master Suite w/King, LCD TV, Full Bath, & Deck Access, 1 w/King, LCD TV, & Deck Access, 1 w/King & LCD TV (Share Full Bath), 2 w/Queens & LCD TVs), & Full Hall Bath. Top Level: Great Room w/LCD TV, Digital, DVD, Wet Bar, Deck w/Panoramic Ocean Views, Dining Table (10), 2 Tables w/Seating for 4, Bar Seating (5), Kitchen w/2 Dishwashers, Screen Porch, Half Bath, 1 Master Suite w/King, LCD TV, Full Bath w/Whirlpool & Shower, & Access to Screened Porch. Features include: C/AC & Heat, Washer/Dryer, 2 Dishwashers, 2 LCD TVs, Multiple LCD TVs, DVDs, 2 Wet Bars, Wireless Internet, & Deck & Pool Furniture. No Pets. This is a Non-Smoking Unit. Loved the house... the artwork inside was Beautiful and the location was great. Looking forward to my next stay here. Never Never Land is absolutely beautiful!! Everyone in my group complimented the house the whole week! Everything is so cutely decorated and those chairs on the 3rd floor deck are awesome!! The kitchen is also very very well stocked, and had absolutely everything we needed. The home was excellent and I received a lot of kudos for making the selection. Beautifully maintained. Nicer quality than any we've stayed in over 30 years. Beautiful home. Very well equipped kitchen. This house, with its property and access to the beach, was amazing! I got lots of kudos for selecting it. Our entire family really enjoyed our time there. There was plenty of comfortable seating, dining seating, refrigerators and dishwashers to handle everything our family of 17 threw at it. Also enough dishes, drink ware, small appliances, pots and pans and utensils to cook every night we were there. Appreciated having the gas grill as well. We loved the access to the beach, plus the pool and hot tub. Everything got lots of use.